You've been seduced by the sad-eyed charmer of dog world. 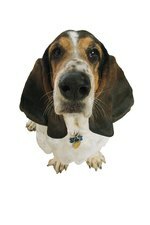 Before you collect your Basset hound pup from the breeder, there are a few things you should know about this breed's personality and behavior. You'll also need to puppy-proof your home and get him some sleeping, feeding, grooming and exercise equipment. Calm, clownish, affectionate and good-natured, yet also sensitive and stubborn all describe the Basset. His independent nature requires firmness from you during training or he'll tend to do what he chooses. Although he has an independent streak, he doesn't like being left alone for long periods. If you're out working, another pet in the house, even a cat, will keep him from fretting. Because he's heavy-boned and short-legged he's prone to joint damage, particularly while he's growing. Make sure he doesn't climb stairs or jump on and off furniture, especially before he is one year old. Indeed, throughout his life you may need to lift him in and out of cars. He's not an exercise lover, which makes him prone to weight gain, so you'll need to make sure he gets a good walk every day once your vet has given the all-clear for your pup to go outdoors. Your Basset pup is a toddler. Block off his access to stairs and decks with stair gates. Don't let him near the swimming pool if you have one. Keep all electrical cords and cellphones out of his reach: they're ideal chewing material to him. Make sure all household cleaners are safely out of his reach and if you have a yard with plants, check that there are no poisonous varieties. Azaleas, oleander, daffodil and foxglove are among the list of toxic plants, but check with the ASPCA Animal Poison Control Center for more information about poisons and your Basset pup. Never leave him outside unattended: if possible fence off a bit of your yard for him. Keep garden compost and any food garbage in firmly-secured bins and make sure he can't get into a shed or garage if he should happen to escape from the house. Start crate training him from the moment you get him home. Kit out his crate with soft, snugly bedding and some chewy toys. This is his special space where he can sleep, relax and feel protected. You should always put him in his "room" when you go out so you know he's safe. It should also help with toilet training, because he won't want to foul his bedding. He might cry and whimper for the first few days because he misses his mum and siblings, but only let him out for play time, feeding and pottying. Take him out for pottying every three to four hours until he's about four months old. In terms of general grooming, cleaning your Basset's long ears weekly is a priority. Clip his nails roughly every three months: take him to a vet or a groomer for this, unless you're experienced in pooch pedicures. Although he has a short coat, he is a shedder, so keep your vacuum cleaner nearby. Bassets are notorious foodies, so you need to watch his consumption. The breeder will advise you about which food to start him on and a feeding regimen for his age. When you walk him, always use a leash or harness. Bassets are scent hounds and if you don't have a firm hold of him he's likely to take off after any interesting smells.